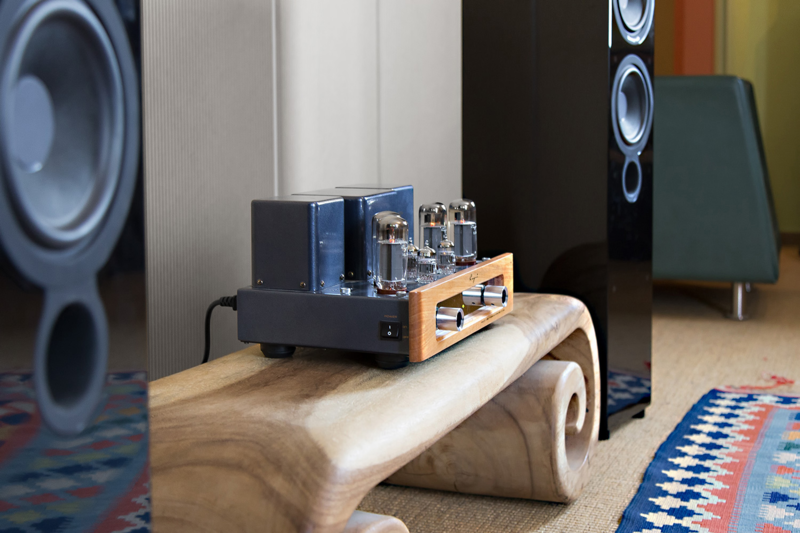 One of the many bonuses of our comprehensive HiFi range is that you can endlessly experiment with the possibilities of various components. Of course, does not mean necessarily that the result is convincing in every case, but there are always variations that simply make sense. TPrecisely the case with our new Hifi-Bundle, consisting of Cayin MT-34L and Cambridge Aeromax 6, which we will now present. 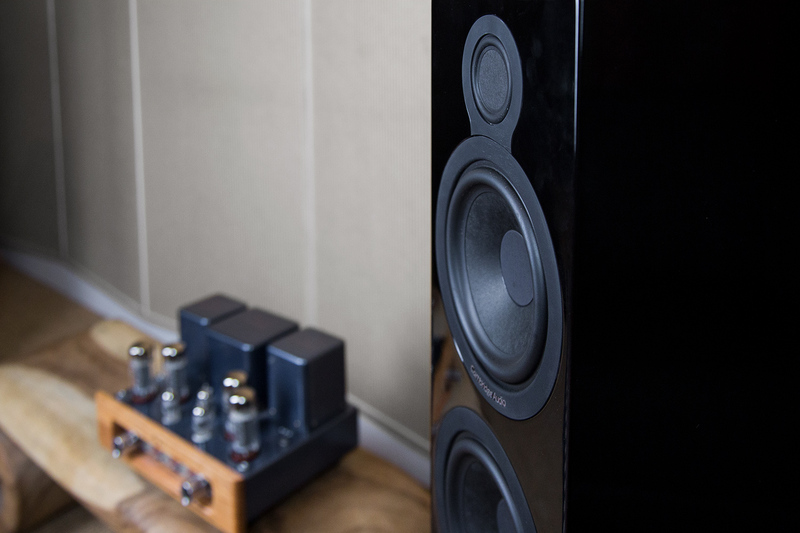 First, we take a look at the loudspeakers of our HiFi sets, the Cambridge Audio Aeromax 6. Contrary to the purist tube amp Cayin MT-34L, this choice might appear at first glance somewhat unorthodox and raises at least two reasons legitimate questions. First, a healthy dose of skepticism is quite appropriate when a company that is known for its hi-fi electronics primarily goes to the speaker market – not for nothing there are dedicated speaker manufacturer who developed their special know-how for years and decades have and refined. In addition, Cambridge Audio has decided in a particular case for an equally unusual and challenging driving concept that requires some explanation. Before embarking on the so-called BMR received however (Balanced Mode Radiator) in detail is given with regard to the first point already clear: The team led by the experienced technical director Dominic Baker has already demonstrated in the past its capabilities in loudspeaker successfully demonstrated and astute observers might not have been unaware that even the special midrange and tweeter transducer has already been tested in previous models. In fact, comes in the Aeromax 6 the fourth stage of development of the BMR for use. This basically combines two different principles of sound generation, the one usually associated with different transducer types. On the one hand it involves the classic dynamic transducers with voice coil, a diaphragm like a piston moves back and forth in order to reproduce the music signal. On the other hand, the BMR makes the principle of so-called surface or bending wave radiator own, produce sound in the controlled natural oscillations in different areas of the membrane. Here the tendency problematic signal separation in separate midrange and tweeter units about the transition from the first to the second mode is practically seamless and frequency dependent, the BMT of Aeromax 6 represents the entire range between 250 Hz and about 22 kHz. 3 kHz – this frequency range is critical for speech intelligibility and the human ear here particularly sensitive – thus eliminating the need and there is a particularly homogeneous and harmonious impression in the midrange and treble reproduction. Another advantage is also the wide viewing angle, so that the upper frequency range is fully ready to well beyond a millimeter tuned stereo triangle. For a powerful bass foundation beyond the 250 Hz mark care, supported by a bass reflex port, two 165mm woofers that operate in a classic by the above-mentioned electrodynamic principle. In order for the woofer are technically less interesting than the BMT whose performance, however, the sound image are nowhere gradually round properly downwards from. This is promoted by the stable and thanks to internal bracing extremely low-resonance housing of Aeromax 6, in addition to the drivers and the crossover, the connecting terminal and the internal OFC cabling (Oxygen Free Copper) – all in best quality – hosts. Now let us turn to the tube amp Cayin MT-34L. 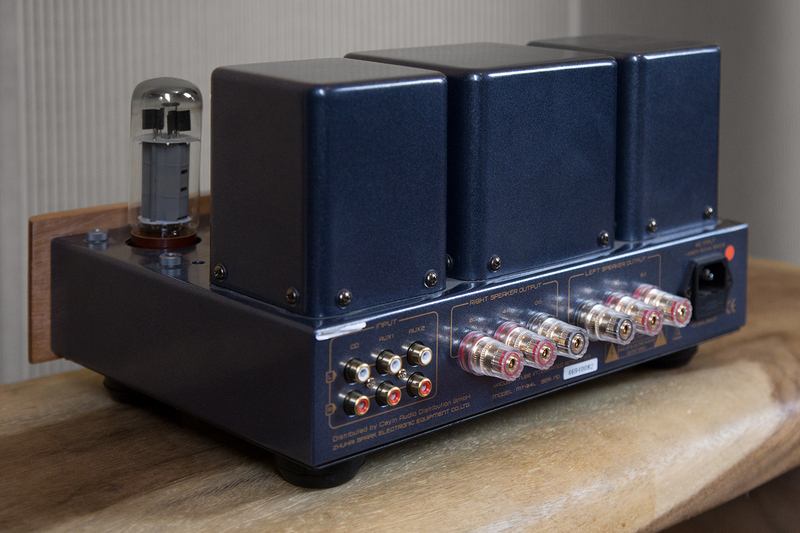 Although this course is an absolutely modern piece of technology, the integrated amplifier developed in Germany and manufactured in Asia technologically oriented and visually clearly to hifi historical predecessors of the pre-semiconductor period. A comprehensive digression about tubes would here certainly beyond the scope, however, is so much said Lange were tubes an essential component of any amplifier circuit and have been increasingly replaced by the development of the transistor. Although the latter actually numerous advantages offer – lower sensitivity, a smaller footprint, the possibility of integrated circuits to build etc. – the vacuum flask, but valued for their special tonal qualities remained and therefore also used by some manufacturers today. 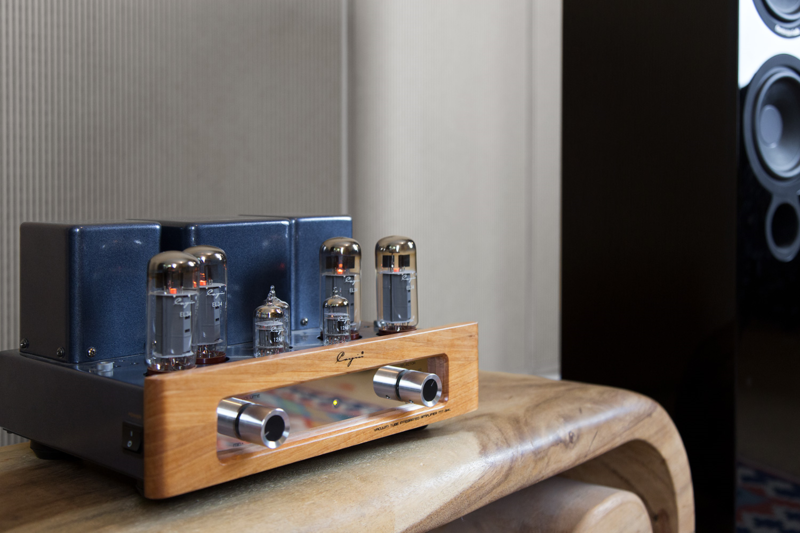 So also in the case of Cayin MT-34L, of a for audio applications absolutely classic Tubes – comes up – 2xECC 82 (12AU7), 1x ECC 83 (12AX7), 2x EL34. In terms of features is facing the tube technology initially worth mentioning that the amplifier has easily accessible measuring points and corresponding screws has, on the quiescent current for the tubes, also called bias, can adjust easily. In normal operation, there is nothing to be noted, however, wear the tubes – also one of its peculiarities – after a few years and must eventually be replaced. Then an adjustment of the bias current to the new tubes has to be done necessarily. Where there is insufficient knowledge exists, a short stop at the recommended service technician. Overall, the compact Cayin MT-34L is mainly characterized by the concentration on the essentials. High-quality components, a cleanly designed interior and a solid case with stylish wooden front. Three sources – CD, Aux 1 and Aux 2 – can be connected via RCA and select via the right button on the front, left side is the volume control. Speakers can be selectively connected to 4 or 8 ohm outputs. In the case of Aeromax 6 we opted for the 8 Ohm version and go. Immediately fills a homogeneous and harmonious overall sound space, the BMT Cambridge Audio unfolds a broad stage, the instruments are clear and differentiated places. Clock for clock is a warm and very musical sounding, gimmickry, or even strenuous peaks developed in the height range you are looking for here in vain. 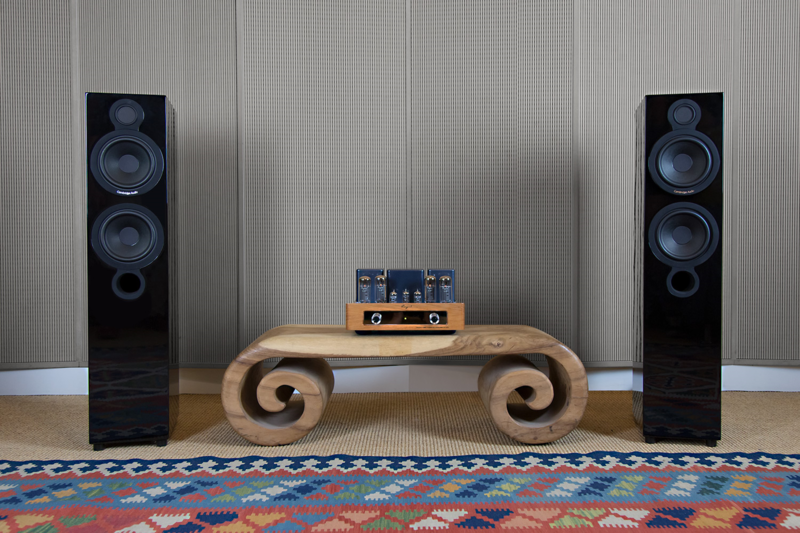 Although not a full-range speaker in the Aeromax 6 in the strict sense, is reminiscent of the sound associated with the Cayin MT-34L entirely to the classic combination of wide belts and tube amplifiers. The bass is rich and deep, emphasized neither dirty nor excessive simultaneously. This sound works across genres and makes more than good dynamic behavior immensely fun. Conceptually limited power reserves are less plentiful than other amplifying and maximum control is not here at the very first place the priority list. However, these restrictions are absolutely to get over the face of enormous joy. So everything important to our HiFi bundle would say at this point. More information and specifications can be found naturally in our online shop. Finally, we have left you cordially invite you to a hearing session in our listening studios so that you can give to themselves a taste of this highly musical duo.